Salad Smackdown: Cauliflower and Grain FTW! 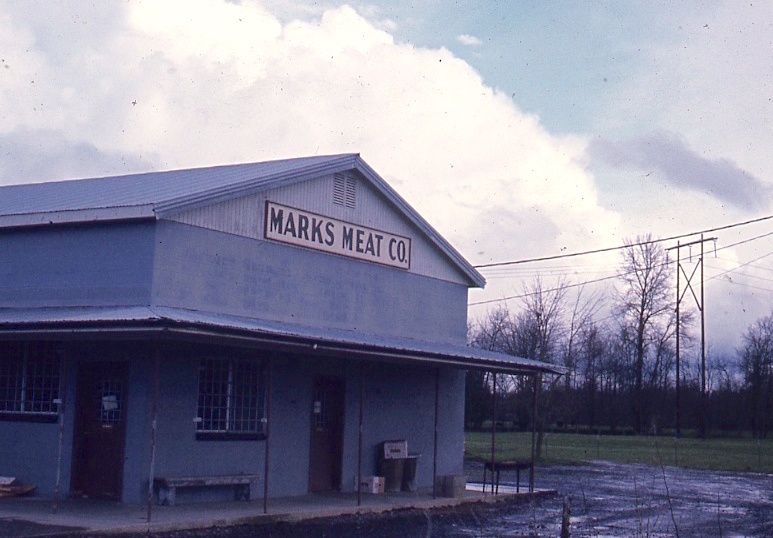 This series looks at how one small processor, Marks Meats in Canby, is transitioning from the founding owner-operators to a new generation of ownership under the name Revel Meat Company. 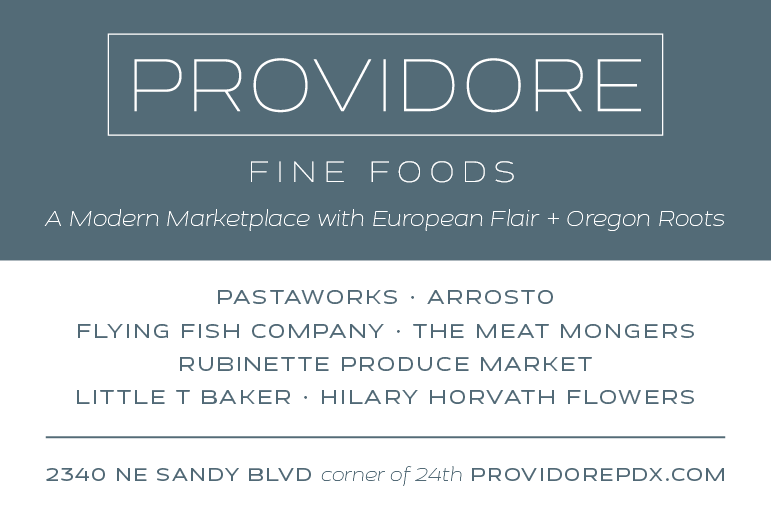 This post was developed in collaboration with Old Salt Marketplace, a supporter of Good Stuff NW. 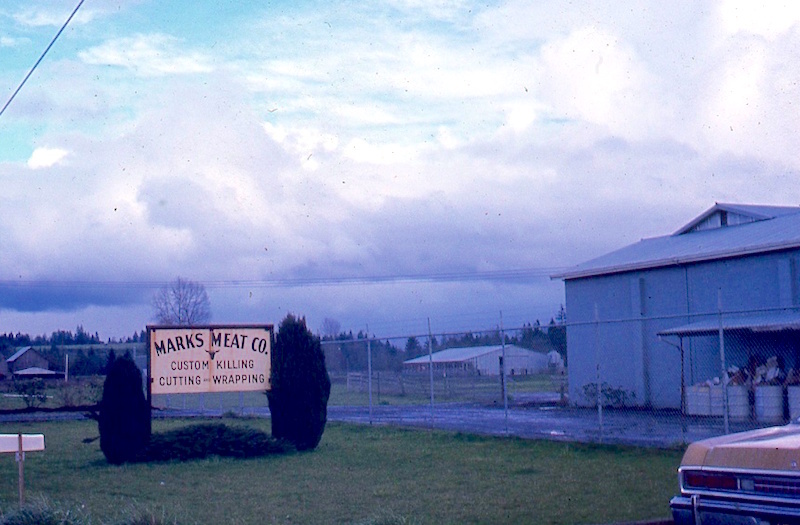 Floyd Marks opened Marks Meats on South Mulino Road in Canby, Oregon, in 1963. His daughter, Kris, who was a very young child at the time, still remembers the opening party in the brand new slaughterhouse. The band was set up on a platform over the drain where the animals were hung to bleed out, with the dance floor in the middle of the room. Originally solely a slaughterhouse, Floyd designed the compact footprint of the facility to maximize efficiency and, as the business expanded, to accommodate an on-site processing facility to make sausages, bacon and smoked meats. 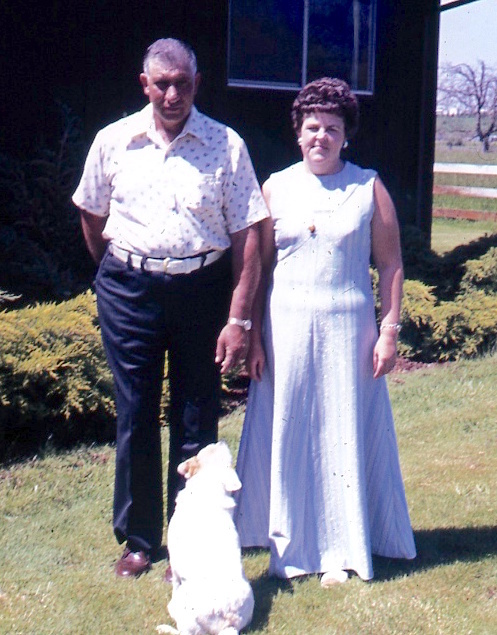 Floyd and Martha Marks (c. 1975). In the mid-1970s, when their mother decided it was time to retire from the business, Kris and her sister Judy were asked to step in, Judy working with the animals on the kill floor and Kris managing the new processing side. By this time Kris had married her husband, Joe Akin, and they were the parents of two young children. As a teenager, Joe had applied for a job at the plant and, like Jimmy Serlin would many years later, he found his calling working there. When their father was ready to retire, the business was turned over to Judy and Kris. When I expressed surprise that a slaughterhouse might be run by two young women, she reminded me that in many old farm families it was not unusual for the women to do the butchering. it wasn't something foreign to us. "If you grew up on a farm, you also did that as part of it," she said. "Dealing with the animals that you raise and the vegetables that you raise and processing them all the way through, it wasn't something that was foreign to us." 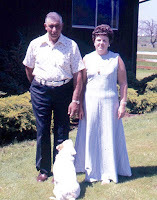 Judy eventually left the business, and Joe took over running the kill floor while Kris worked on the processing side and took care of the immense amount of record-keeping required for the facility's Federal Grant of Inspection from the USDA. The grant allowed the business to slaughter and butcher animals, and involved a difficult and costly approval process, one that guarantees that procedures are in place to ensure that the meat it sells is safe and inspected before, during and after slaughter. 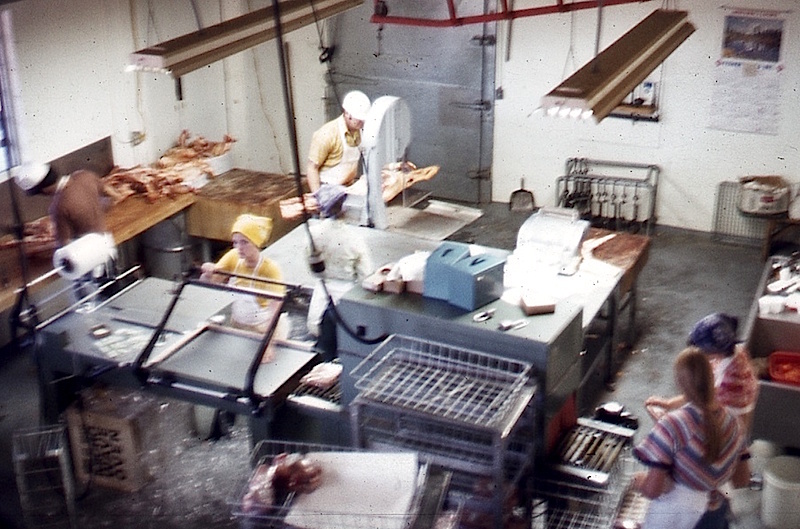 Processing room at Marks Meats (c. 1975). Around ten years ago it became difficult for Kris and Joe to find trained, competent help in the slaughterhouse, so Kris stepped onto the floor to work alongside her husband. 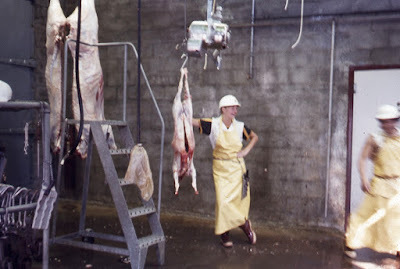 While he did the stunning—essentially rendering the animals brain-dead—at the height of their production they managed a schedule that rotated through 30 beef in a day, and other days processed 24 to 30 pigs or 75 or 80 lambs, a crushing amount of output for a small facility. Approaching retirement age, they both knew that this kind of heavy production schedule was unsustainable, so Kris began to put the word out that Marks was looking for a buyer. An attractive prospect, the business drew several inquiries because of its up-to-date plant and that all-important grant of inspection, not to mention its accessibility to both area farms and a Portland customer base. But none had quite the right combination of factors required for a transition of ownership that would take several years to complete. Enter Jimmy and the young crew of food revolutionaries from Let Um Eat who had bought a farm down the road and, driving by one day, saw a sign outside advertising a sale on steaks. The young people were just customers at first, but the sudden departure of an employee left Kris short-handed, so she asked if they knew of anyone who might be be interested in helping out. "Then Jimmy showed up because he was interested in learning what we did," Kris said, though it was obvious from the get-go that he had no idea what an immensely physical job it was. "It’s like working out at the gym for eight to ten hours. He was on the kill floor, doing skinning and pushing and pulling and different movements that you don’t normally do." For Jimmy’s part, he said, ”I didn’t realize how excited I was about it till I started.” When his own father passed away a few weeks into his stint at Marks, a particularly heartfelt conversation with Kris and Joe about her father and the beginnings of Marks cemented his decision. "It became clear that it was something I’d wanted to do for awhile [but] I never really thought about it," he said. "Being there, I think it keeps me in line with with what my old man did." in order to keep the business running. Kris remembers that fairly soon after he started, Jimmy said he was looking for something more permanent than simply being an employee. "He wanted to know more about the business and possibly join us in some capacity," she said. "And we were wanting to get out. We’d been doing this for a long time and physically we needed to have younger people do it in order to keep the business running." The key phrase Jimmy got from his conversation with Kris? "If you’re interested, let’s talk." At that point, as far as he was concerned, the decision was made. "How can we can we all talk about Let Um Eat and the collective and not take the opportunity to take over one of the most crucial pieces to the small farm and sustainable food movement?" he remembers thinking. The other members of the collective, however, were not on board with making that kind of long-term commitment. Or as Jimmy said, "They were like, haha, we have a thousand other things going on." Knowing he couldn't do it alone, however, meant that he needed to find partners who could bring additional skill sets to the table. He approached Ben Meyer, who was already working with local ranchers and farmers on a whole animal program for his Portland restaurants Old Salt Marketplace and Grain & Gristle. Bringing butchery, merchandising, retailing and processing expertise, Meyer was the perfect fit. To complete the team, Meyer brought in cattle rancher Ryan Ramage of Ramage Farm in Oregon City. Meyer had already identified that it was critical to keep Oregon's surviving small processors alive, as well as the need to add more. Crucial to this was figuring out the stumbling blocks faced by existing processors, which had been steadily closing since the '70s. "Every one we lose is another opportunity for a small rancher to process," he said. So when Jimmy presented him with the opportunity to buy Marks, he recalled, "I immediately said we need to at least talk about it." the rest of the business isn’t going to work. Meyer began working alongside Jimmy on the kill floor soon after that, with Kris teaching them the arcane, detailed and exhausting work that goes into processing in a USDA facility. Also involved were endless conversations about how to transition to new owners from a second generation, family-owned and run business. Kris said that the last eight to ten months have been spent seeing if Ben and Jimmy could learn how to handle the work. "It’s the most important part, because if they can’t do that, the rest of the business isn’t going to work," she said, emphasizing that the learning curve is a steep one. "You need to get up from kindergarten to college really fast. If you’re going into this business from an apprenticeship level up to a journeyman, it can take up to ten years. So doing it in this [short] length of time, it’s difficult." Other complicating factors are that Marks is a corporation, with a USDA grant of inspection involved. Being the shrewd businesswoman she is, the key to a successful transition, Kris said, is that "you’ve got to make it work for a business, because you can’t make it work for everybody if it doesn’t make business sense." When I asked what the hardest part of the process has been for Kris personally, she paused. "Probably the letting go and letting somebody else do something for me," she said. In the past, she said, "If it didn’t get done, I had to do it and make sure it got done." Read the first post in the series, Rejuvenating Local Processing. The final post in the series focuses on the future of small processors, titled Upending the Status Quo, with an interview with Revel Meat co-owner Ben Meyer.